What Are Your Goals for Your Front Entryway Door? You do not need to be a professional designer yourself in order to create a professionally designed custom front door. All we need from you is a general idea as to what your goals are for the door. You can let us know which materials you would like used, and which design elements are important to incorporate. 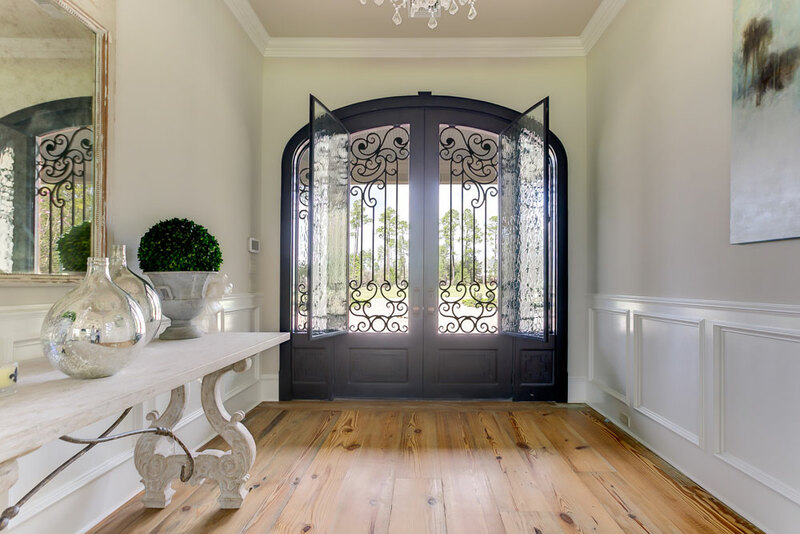 Some homeowners will use pictures of other custom doors in order to pick and choose various elements that they would like implemented within their own original design. 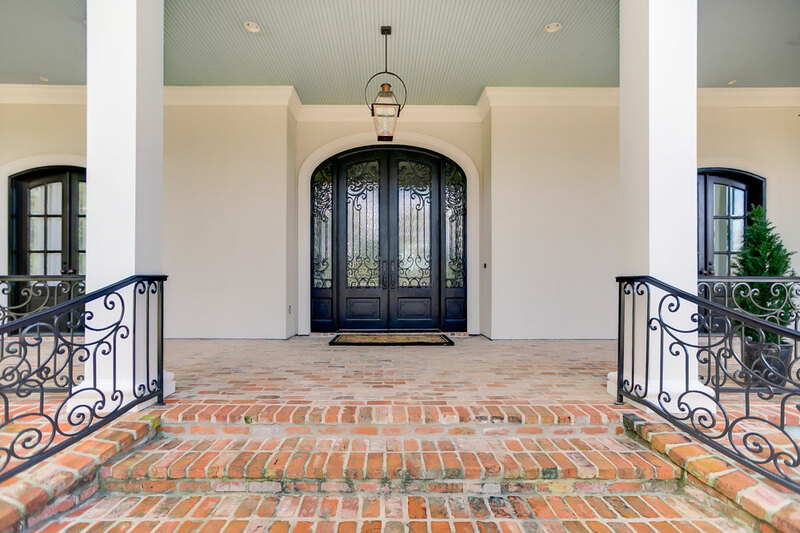 Our team has been designing and building custom front entryway doors in New Orleans and Mandeville for several decades now, and there is not a design challenge that we cannot successfully face for you. If you have no idea what you would like your door to look like, this is not a problem either. Our design team can provide professional recommendations for you based on your home, your preferences, and their experience and knowledge. We are prepared to create custom doors for you that are of any shape or size, and we will also design and install custom set pieces to go around the door, if that is what you need. You let us know what you want from your custom front door, and we will make it happen. 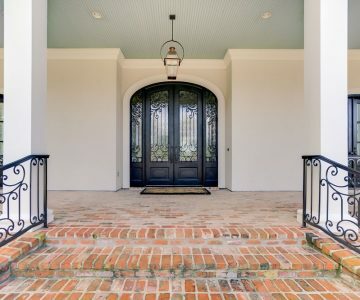 Having a custom entry door designed for your New Orleans or Mandeville home means that you have the opportunity to choose which materials you would like used in your front door construction. Each type of material has its own advantages when it comes to both function and design. 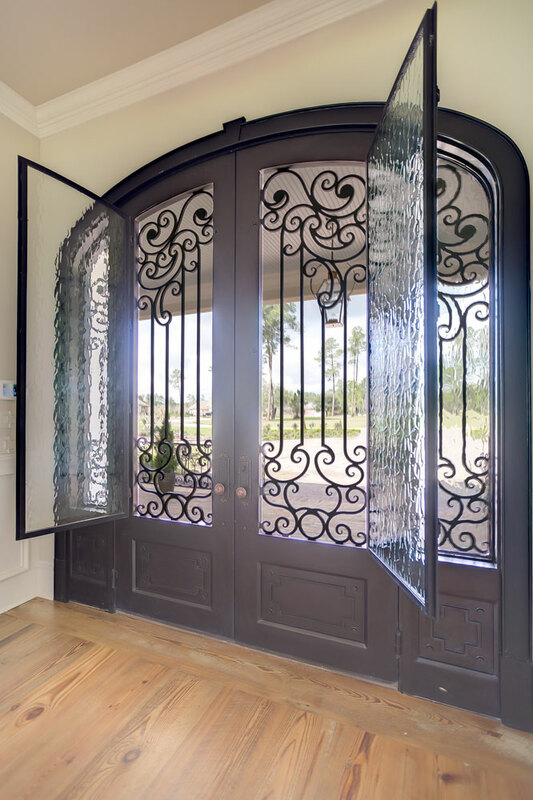 The most common types of materials used in a custom entryway door design include glass, wrought iron, or a specialty wood, such as cedar or mahogany. 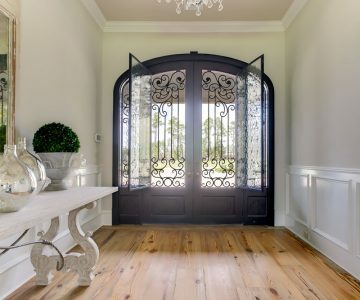 Custom wooden doors provide a great way to give your entryway a warm rustic feel, while glass doors complement more modern and polished architectural designs. Having a door custom designed also affords the opportunity to incorporate many different types of materials into one door. Our design team could, for example, create a hand carved wooden entryway door with glass set pieces. Not all homeowners choose to have a custom front door created just because they are interested in having an elaborate design. Many people choose custom doors simply because they need a door that will provide a practical solution to a design challenge. For example, there are many New Orleans and Mandeville homes with entryways that are not your standard entryway shape and size. Therefore, the homeowner may want a simple door, but will need one custom designed in order to achieve the necessary fit. There are many advantages to having a custom front entryway door designed for your home. You may want to incorporate materials that create a cohesive look with your exterior and/or exterior design of the home, or you may want to have a door created that would emphasize aspects such as security or insulation. Whatever your design goals may be, our team can create a custom entryway door that will meet your needs.